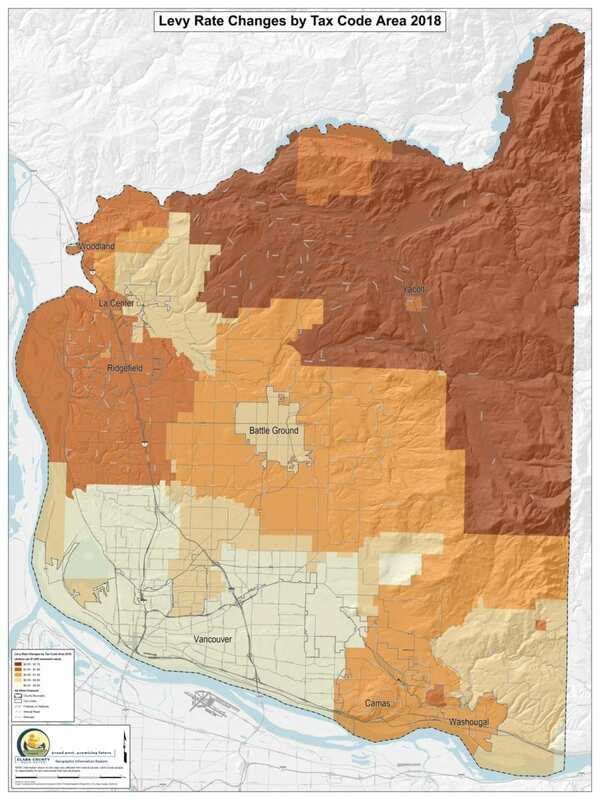 VANCOUVER — Residents across Clark County will all see a property tax increase this year, according to Clark County Assessor Peter Van Nortwick, with increases varying based on where one lives. Changes at the state level are the reason that all property taxes in Clark County are increasing, Van Nortwick said. The state legislature implemented part two of a state school funding levy, which is designed to transfer property taxes from funding local school maintenance and operations levies to state funding for schools. $1.50 to $1.99 levy rate increase: Areas in the northwest part of the county near Ridgefield were affected by a $0.91 increase due to the Ridgefield School District bond. Areas in the Clark County Fire and Rescue jurisdiction had an increased rate of $0.09, and areas in the former Fire District 2 that merged with Clark County Fire and Rescue increased rates by $0.86. $0.89 to $1.49 levy rate increase: The central part of Clark County excluding Battle Ground saw rate increases in Washougal totaling $0.50 due to a new EMS levy. Camas School District and Battle Ground School District had levy rate increases of $0.58 and $0.09, respectively. For residents in Fire District 3, rates increased by $0.13 and residents in Clark County Fire and Rescue boundaries saw a rate increase of $0.09. $0.59 to $0.88 levy rate increase: The city of Battle Ground does not fall under Clark County Fire and Rescue jurisdiction, it instead has a contract with Fire District 3. Other lighter areas of the map were affected by the Van Mall Annexation and properties in the Battle Ground School District had levy rate increases of $0.09. $0.42 to $0.58 levy rate increase: The lightest areas of the map such as Vancouver were not affected much save for the new state school levy rate. For the years 2018, 2019, 2020 and 2021, the state imposed a property tax rate of $2.70 per $1000 of assessed home value across the state. This serves as a baseline tax rate. Each county is given a ratio of assessed property value compare to market value, and that ratio is used to determine the actual property tax rate paid by county residents. Clark County’s tax ratio was 92.8 percent for 2018, Van Nortwick said. This means that when calculated out, the property taxes levied in Clark County will be $2.89 per $1000 of assessed home value. The tax rate encompasses parts one and two of the state schools funding levy. Based on the current state situation, school districts can still collect their entire current maintenance and operations levy at whatever the current rate is set, on top of the $2.89 per $1000 that is being introduced as a result of the state changes. However in 2019, Van Nortwick said that local maintenance and operations levies will be considered enrichment levies and capped at $1.50 per $1000 of assessed home value. Enrichment levies cannot be used for funding basic education, Van Nortwick said, which means that is now provided for by the state educational levy. “A lot of them [school districts] that had the biggest increases this year will have the biggest decreases next year,” Van Nortwick said. County wide, the changes at the state level will mean that there is an increase of $0.91 per $1000 of assessed home value over last year’s state school levy. Individual areas of the county have experienced varying tax increases. The lowest overall tax increase is $0.42 per $1000 of assessed home value, and the highest increase was $2.76 per $1000 in assessed home value. Van Nortwick said that areas in the southwest of the county around Vancouver experienced the lowest increases in taxes. For example, Vancouver’s taxes only increased because of the changes to the state school levy. However, the northeastern region of the county has seen the largest tax increases, in many parts ranging from an increase anywhere from $2.00 to $2.76 per $1000 of assessed value. Van Nortwick said that these larger increases were because voters approved EMS levies in the north county and in Yacolt, equating to an increase of $1.35 and $1.24 respectively. Additionally, the Camas and Battle Ground school district levy rates increased by $0.58 and $0.09, respectively. Finally, in the areas hardest hit by the increases, levy rates for Fire District 10 and Fire District 3 increased by $0.31 and $0.13 respectively. Other parts of the county also experienced lesser tax rate increases due to fire service levies and school levies and bonds from previous years. The two bonds in La Center School District and Evergreen Public Schools approved by voters in the Feb. 13 do not affect the 2018 tax rates. “Almost all of these are voter approved,” Van Nortwick said, regarding increases for fire district and EMS service increases. Property values in Clark County have increased this year. Van Nortwick said that in general, as the assessed value of residential properties in the county increase, the individual tax rate as determined by the county’s ratio decreases. He said that it is “highly unusual” to have assessed values go up and tax rates to go up as well. Taxpayers in Clark County have expressed disgust for the increases across the county. Responses to a social media post by Clark County Today showed that tax increases for some county residents have ranged from $420 to approximately $1600. Brandi Roberts, a resident of the northern part of the county, said that her tax increases were approximately $1000 for 2018, and that after six years of living in Clark County, her taxes have increased on the whole by $2000 per year. “This is not right and the county is getting too expensive to live in,” Roberts said. In 16 years of owning a home, Jennifer Heffernan said that an increase of $420 this year was the highest she has ever paid. Many respondents expressed trepidation as to whether they would be able to continue to afford the cost of living in Clark County. Milissa Wooldridge, an 18-year resident of Battle Ground, said that large property tax increases have her family wondering if they will be able to afford to live in the area. “We are just hoping we can stay here and retire and still afford our home,” Wooldridge said. Van Nortwick said that as the assessor, “my job is to equitably distribute taxes.” He said that the actual total amount of taxes that need to be collected are determined by the tax districts. “I’m concerned with equitable distribution, not level of taxation,” Van Nortwick said. He also explained that the tax rate increases do not affect people that fall in the senior or disabled exemption program.